Implementing a new brand using a 15 year old infrastructure. Welcome Stanford Health Care to 2 East Bay campus locations. Stanford Health Care acquired their first acute care facility outside of the Palo Alto campus. 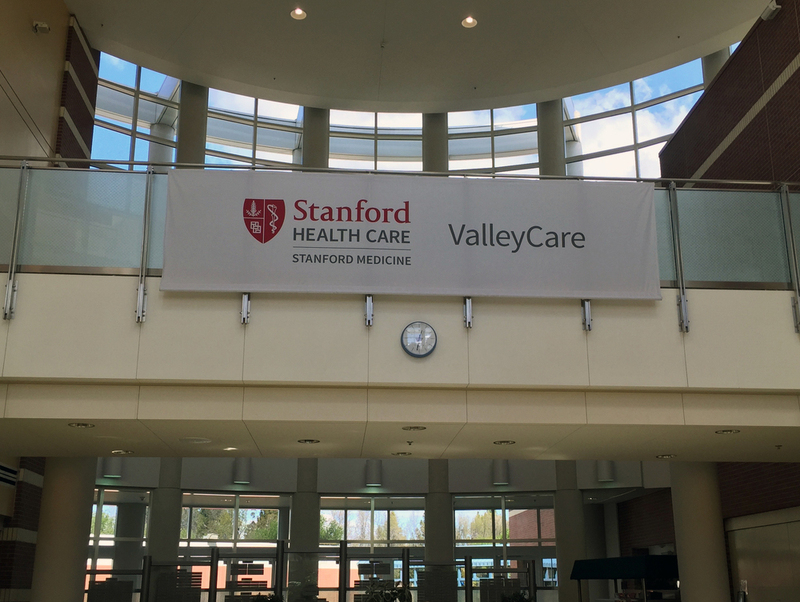 ValleyCare's Pleasanton and Livermore Campuses had a new name and Shannon Leigh was brought in to rebrand both campuses. Shannon Leigh worked with the SHC Marketing Department to develop signage brand guidelines for the campus. Valley care had existing assets that had to be retrofitted and a very tight schedule as this new merger was rolled out to the East Bay Community. There were many high profile stakeholders and a huge celebration planned significantly ahead of schedule. Shannon Leigh managed the vendors, hired event specialists and made everything happen with flawless execution. Shannon Leigh completed the work in less than six months and developed community displays and additional signs support for the big unveiling for the ribbon cutting.